UNITED NATIONS In a rare show of international unity, the United States, Russia and all 15 members of the U.N. Security Council announced Wednesday that former Portuguese prime minister and refugee chief Antonio Guterres of Portugal is the consensus candidate to be the next U.N. secretary-general. The formal vote, most likely by acclamation, will take place in the Council on Thursday, followed by the vote in the General Assembly. Guterres will become the ninth U.N. Secretary General and will take office in 2017, when South Korea’s Ban Ki-moon, departs after serving two terms. Guterres has the experience of a decade as High Commissioner of the U.N. agency perhaps most in the hot seat, the U.N. Refugee Agency. 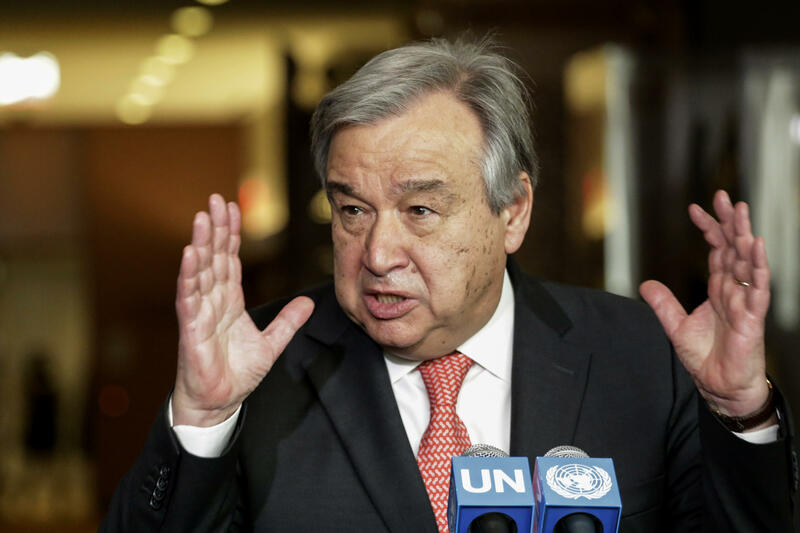 “There has been a multiplication of new conflicts; old conflicts seem never to die; our relationships are all becoming less and less clear; and so, it is absolutely essentially to mobilize the entire international community,” Guterres said. Most diplomats in the U.S. – and around the world – are focused squarely on the U.S. presidential campaign, while the quieter race was taking place to find a new leader for the largest international organization on Earth, with a budget of $5.4 billion for 2016-17. In the end, the choice became clear: a seasoned Portuguese former Prime Minister won widespread support – António Manuel de Oliviera Guterres. Personable but outspoken, Guterres rose to the top of what began as a 12-candidate slate, which was ultimately reduced to a field of 10. Guterres studied at the Instituto Superior Técnico, an elite engineering school of the public University of Lisbon, where his first major was theoretical physics; and his first job was teaching physics to university students. But his college years – 1966 to 1971 - were turbulent. Midway through Guterres’ college years, Portugal’s politics began to shift; it had been 35 years under the thumb of authoritarianism, and Guterres’ interests shifted as well, to politics and diplomacy. Portuguese dictator and Prime Minister António Salazar was in office until 1968. As one of the leaders of the student movement to restore Portugal to democracy, Guterres’ was absorbed with being a “revolutionary” and making a difference. Guterres’ career has covered a lot of ground: He became a member of the Socialist Party in 1974. When the dictatorship of Marcelo Caetano fell during the Carnation Revolution, he worked in the office of the Secretary of State of Industry. He went on to serve as a deputy in Portugal’s National Parliament, then became the secretary-general of the Socialist Party. He was elected prime minister in 1995 and served for two terms. From 2005 to 2015, he served as the U.N.’s high commissioner for refugees, elected by the General Assembly. Guterres was hardly a foregone choice. By tradition, the secretary-general job is supposed to alternate between regions, and it was the turn of Eastern Europe; in addition, several organizations have pressed to have the first woman elected secretary-general. The vetting process was unusual for the race. The United Nations, for the first time in history, decided to shed some light on the selection of secretary-general. Long-chosen in back channel negotiations by the Security Council members, candidates were nowvetted in a series public hearings by representatives from 193 nations. However, the final choice remains in the hands of the Council and the five permanent members (U.S., U.K., France, Russia and China), who all have veto power. The Council sends a chosen candidate to the full 193-member General Assembly for a two-thirds – essentially rubber stamp – vote. The role of the U.N.’s secretary-general is critical to the U.S. and the world. The secretary-general manages a staff of 44,000, not including 104,000 peacekeepers, and is responsible for issues that range from refugees to pandemics, human rights and climate change. The secretary-general also plays a role in influencing the Security Council, as well as the fundraiser-in-chief for the U.N. Rocked by unresolved conflicts, scandals including sexual assaults by peacekeepers and a bribery scandal, the hope expressed by many diplomats is that the next chief will restore credibility to the 71-year-old organization and, perhaps, help to warm relations that have soured between the U.S. and Russia. The U.S. contribution remains the largest at 22 percent of the regular budget ($5.4 billion) and 28.5 percent of the peacekeeping budget ($8.27 billion) -- significantly higher than other countries. Already, there are several “firsts” in this year’s race to head the world body: for starters, it’s running concurrent with the U.S. presidential election, the first time since the 1950s. Participating in the first ever debate between the candidates were former presidents and prime ministers: the first round was included, besides Guterres: Vesna Pusić (Croatia), Susana Malcorra (Argentina), Vuk Jeremic (Serbia), and Natalia Gherman (Moldova); the second included Helen Clark (New Zealand), Danilo Turk (Slovenia); Christiana Figueres (Costa Rica), Igor Lukšić, (Montenegro), and Irina Bokova (Bulgaria); after the debate, an additional Bulgarian candidate, Kristalina Georgieva, entered the race. Months of back and forth between the five straw polls was reminiscent of an elaborate John LeCarré cold war novel, but through them all, Guterres stayed in first place, garnering 11 or 12 of 15 votes. Nonetheless, Guterres was a consensus candidate from the beginning of the polling at the Security Council.